Das COM220 Telefonmodem ermöglicht Kommunikation zwischen einem Computer und einem Campbell Datenlogger über das öffentliche Telefonnetz. Am PC ist ein passendes Modem erforderlich. Das COM220 wird am Logger angeschlossen, fast alle Logger von Campbell Scientific sind kompatibel. The COM220 has a CS I/O port, power terminals, screw terminals, and an RJ-11C jack. 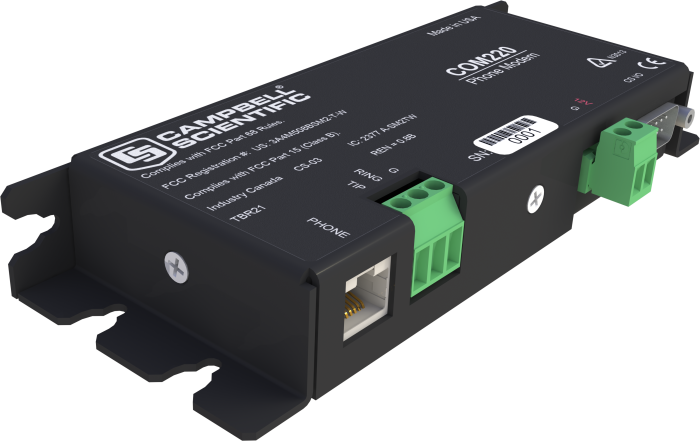 The datalogger connects with the CS I/O port via an SC12 or SC12R-6 cable. The RJ-11C jack is for attaching a surge-protected telephone line. Alternatively, the screw terminals (GND, RING, TIP) can be used to connect the COM220 with a phone line via a surge protector. Typically, a length of phone line is run from the telephone company's junction box to the COM220s surge protector, and then to the Ground, Tip, and Ring terminals on the COM220. Alternately, if adequate surge protection is provided by the telephone company and the junction box supports it, a length of telephone wire with RJ11C connectors (pn 2365) can be run directly from the junction box to the socket on the COM220. Default settings are not compatible for non-PakBus data loggers (i.e., CR5000, CR7, retired data loggers). For these data loggers, the DIP switch settings must be changed; refer to the COM220 manual for details. An SC12 cable is provided for connecting the COM220 with the data logger. LoggerNet and PC400 software packages support use of the COM220 with our data loggers. Both of these software packages support automated error-checking or user-initiated contacts. LoggerNet also supports scheduled contact times. Our software can run unattended allowing the user to take advantage of lower off-hour telephone rates. The COM220 requires a desiccated, non-condensing environment; a Campbell Scientific enclosure is recommended. Grommets and screws are provided to attach the COM220 to the backplate of our enclosures. What type of cable is compatible with the COM220 and can be used for a 2 km distance? Cable runs of that length usually will require a booster of some sort. Contact the local phone company for recommendations. Can a COM220 be used to activate a solid-state power switch? Not directly. A data logger needs to be used with it, and the remote caller needs to be running LoggerNet or PC400. Is it possible to use a COM220 with a data logger to send text messages to a GSM phone? If a phone line is shared with a seismograph that transmits data when it is called from a computer, is it possible to avoid interference by having the COM220 call out rather than transmit after receiving an outside call? No. The COM220 is designed to pick up a call and cannot be overridden. A better approach would be to use a phone line sharing device. Note that the phone line sharing device must simulate a normal phone line accurately or it won’t work correctly with the COM220. One phone line sharing device that has been used successfully by our customers is “The Stick” by Multi-Link. This device takes one incoming phone line and breaks it out to four separate lines. It does require ac power to run. For more information, refer to the Multi-Link website. Can a VoIP (voice over Internet protocol) phone line be used to call a COM220? Campbell Scientific does not recommend VoIP, as it does not work well with data transfers. Is it possible to make an SMS (short message service) with the COM220? Can a COM220 and a spread-spectrum radio coexist on the CS I/O port of a PakBus datalogger? The COM220 and the radio can coexist on the CS I/O port provided that they are assigned two different SDC addresses. Can a COM220 be used to connect to a remote DCP using RS-232 through a cellular telephone? Why would installing a COM220 on a datalogger disrupt the connection to a met station? There are several possibilities as to the cause. Contact Campbell Scientific for assistance in determining the specific cause. Are CS I/O communications possible with the COM220? All dataloggers will work with the COM220 except the CR200X-series dataloggers.